Because you have three audio sources, you need a mixing board, a Fast Track Pro, 2 mics, a slew of cords and adapters. Here is a handy reference picture. 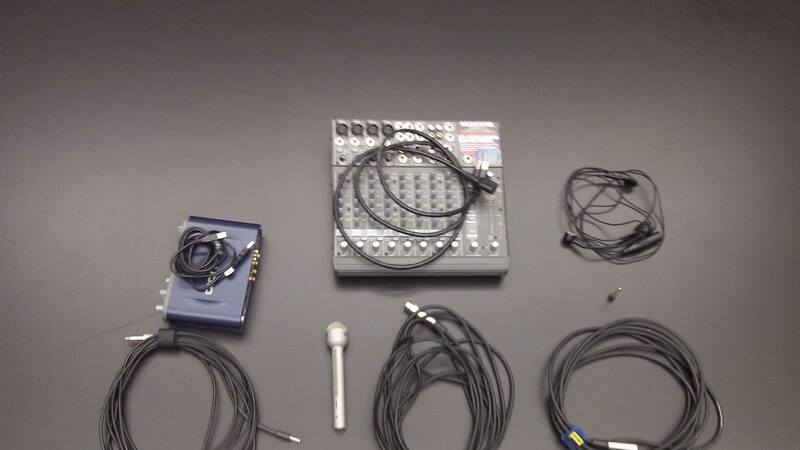 2 xlrs, a head mic, a stick mic, Fast track, usb cord, mini-to-phono adapter, Mackie soundboard, Phono-to-mini cord. We tested the audio using Some online conferencing product by Cisco, but in real life we will be using Adobe Connect. Whhot. So, Library will be a remote site for an ALA session. Apparently, the joint project is garnering interest and we’ve been asked to put together a presentation. We are looking at 45 mins total with 30 mins being scripted content. The Adobe Connect session will be held July 19th from 3-4 in Conference Room A. My participation will include: June 19th, 10 am: tape the Director in his office, get picture. June 20th, meet at the site to collect interviews/pictures and train on how to use audio equipment. I will also help prepare the Powerpoint and set up the audio for the event.